During a recent big snowstorm, I took an amazing ritual walk through the town where I live. We were getting our first substantial snow of the year, and it was a full moon to boot. And so, I spent a lot of time during that walk observing the trees-the snow was coming down so quietly and still–the tree branches were all accentuated by the gentle snow. The conifers sheltered the ground below and kept the snow high on their branches. The deciduous trees, bare for the winter months, let the snow fall right through them. This reminded me of the slowing down of the world, the quietude that comes in the depths of winter, and the changing nature of the work one can do with the natural world and trees during this time. Given this, I thought it would be useful to offer another post in my my Druid Tree Workings series. For those of you new to the blog or to this series, I am writing a series of extended posts on how to do deep work with trees. 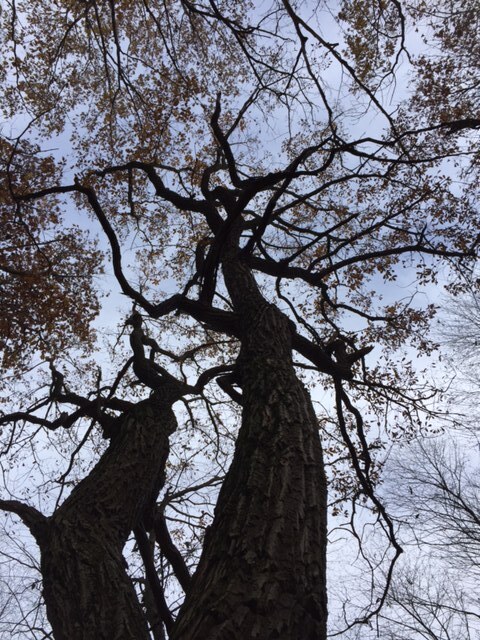 Earlier posts in this series include: finding the face of the tree, druid tree workings on the outer planes, druid tree workings on the inner planes, helping tree spirits pass and winter tree blessings. A lot of druids and earth-centered people want to do deep work with trees but there aren’t good guidelines out there for how to do such work. So part of what I’m doing is sharing some of my own understandings of working with trees on multiple levels. Today, I’m going to discuss the importance of understanding how spiritual work with trees is seasonally determined and how understanding the nature of the seasons and their effects on trees can help you work more closely with them. In studying the oxygen-carbon dioxide cycle on the planet (and mapping it out month by month), a natural pattern occurs. 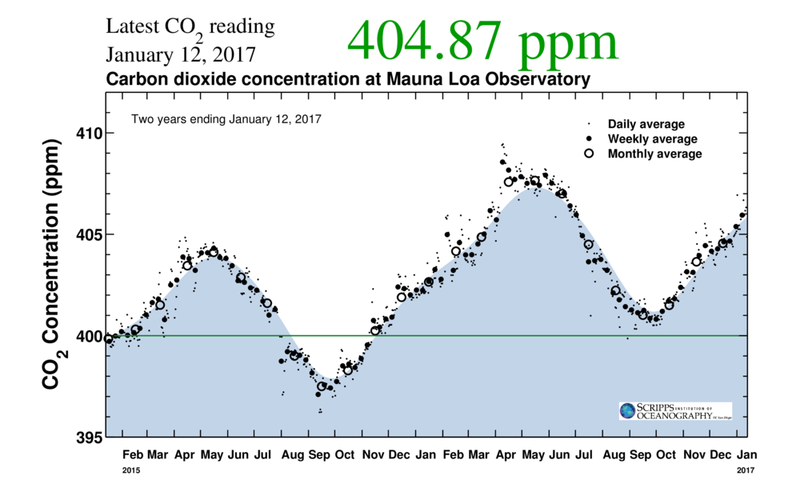 Atmospheric CO2 is at its height somewhere near the Beltaine and at its lowest point somewhere near the Fall equinox. This is, literally, the inbreath and outbreath of the earth. As the trees bud out and plants bloom, photosynthesis begins and they consume CO2 as part of their growth and reproduction cycles. As the trees lose their leaves and the plants die back for the winter, photosynthesis ceases, and atmospheric carbon increases. Below is a chart from Scripps Institute of Oceanography that shows this curve quite effectively (this is called the Keeling Curve, named after Charles David Keeling, the scientist who was in charge of the Manua Loa Observatory in Hawaii starting in 1956). What we can see from this chart is, among other things, the breath of the earth. Just as we breathe in oxygen and breathe out carbon dioxide, the trees breathe the opposite, breathing with us, in unison throughout the warm season, and yet opposite to us. This natural breath is no different than our own natural breath–it just moves at the pace of the trees. That is, like trees, it moves on a yearly cycle (and no, I’m not going to comment on atmospheric carbon levels at the moment–there is enough commentary out there about that). I believe that this natural breath is part of why humans connect so deeply with trees and plants–they offer us balance, physically, in the form of life-sustaining oxygen. And we offer them, physically, life-sustaining carbon as well as nitrogen in the form of our urine. Understanding this cycle on a seasonal basis, this breath of the world, also can help us do deep spiritual work with the trees and plants and understand the role of the seasons. It is to this that we now turn. Several kinds of plants exist in most areas: annual, biennial, and perennial. Annual plants (like many in your vegetable gardens) drop their seeds in a single cycle and then die back, roots and all, at the end of the season with the coming of winter. Biennial plants (like mullein or burdock) have a two-year cycle, often producing a basal rosette in the first year, and then sending up some kind of flower/seed/reproductive spike in the second year. At the end of the plant’s life cycle, the seeds are scattered, the roots die back (as all the energy has gone into the seeds) and the new seeds sprout the following spring. Perennials live season by season; most perennials go into dormancy during the winter months, storing up energy and nutrients in their roots during the summer and fall. Then they re-emerge from dormancy in the spring. Trees, obviously, are perennials, living through many yearly cycles. Understanding the trees’ yearly cycle helps us understand when we might connect deeply with them spiritually. Good night, dear trees! Sweet slumber. I have found that all trees slow down in the winter months, although the nature of the work you can do with them differs. Deciduous trees are especially quiet for the first few months of winter, after their leaves drop (in other words, the period between Samhain and Imbolc or even the Spring Equinox, depending on the season and your location). They are, essentially, at rest for this part of the year; this dormancy seems to extend into the spiritual realm in many (but not all) cases. Just like a sleeping friend, trying to talk with them or work with them spiritually is not the best idea, with some exceptions. For one, they are hard to reach and very slow, and for two, I kind of think its not very nice to wake up a sleeping friend. A lot of deep tree magic doesn’t work well during this time, with the exception of blessings before the season when the sap begins to run. 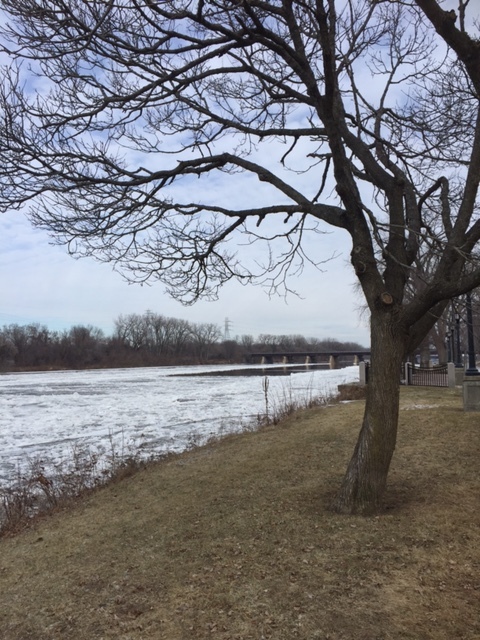 Deciduous trees remain dormant until their sap starts running (for my bioregion, this is typically, Mid February to early March, when daytime temperatures are above freezing and night temperatures are below freezing). This is when the deciduous trees become very active, somewhere between Imbolc and the Spring Equinox. Of course, unless you are tapping maple, birch, or walnut trees, you might not realize their sap is running–but even energetically, you can often sense a definite shift in the tree’s energy during this time. Maple sap runs earlier than birch or walnut sap, typically. I will now note a few exceptions to this general deciduous pattern above: witch hazels (Hamamelis spp.) are particularly active in the late fall and early winter due to their blooming during that time. They have a nickname here in the US as “winterbloom” attesting to the fact that they bloom right as nearly every other tree and plant in the forest thinks its a good idea to quiet down for the coming winter. Hamamelis virginiana, which is the species that I am most familiar with, blooms before and through Samhain and may persist in blooming past a number of frosts and cold spells. Now these blooms aren’t exactly the flashy blooms of the apple or black locust, but they are fitting for the cold season. 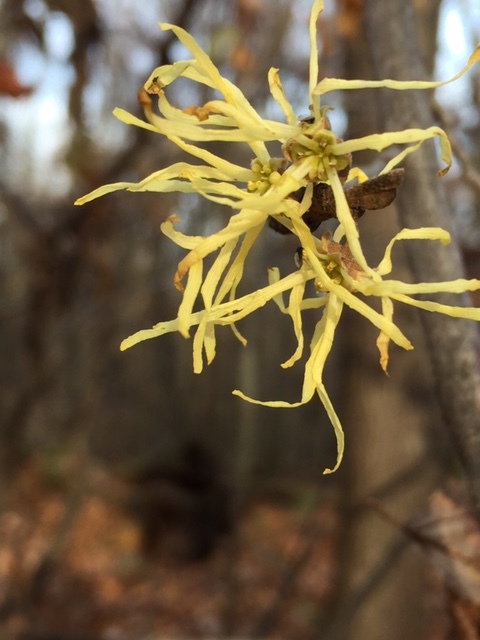 Other species of Hamamelis bloom in January, in the depths of the winter (I have yet to see these)! With these small trees, the very best time to work with them seems to be when they are budding in the late fall or early winter months. As one Senaca legend suggests, Oak (Quercus spp.) seems to be another exception to this general pattern of trees going physically and spiritually dormant in the winter months. Oak, because he holds many of his leaves throughout the winter months, is more “awake” and available to commune with than many of his deciduous brethren. Oak seems to use brute force to keep the leaves through the winter months and loses the leaves just as the oak buds began to swell. The oak, literally, would not let go of his leaves even when they grew very worn and torn, which if you look at an oak in the springtime, this certainly is the case. In my bioregion, the oaks are the last to turn their beautiful shades of purple, orange, and gold–they are the final fall foliage, long after the birches, maples, hornbeams, cherries, and so on have already dropped their leaves. This also demonstrates their lasting awareness through the winter months. The final tree in my bioregion that I have discovered also has more active quality in the winter is the beech (Fagus Grandiflora)–who also holds her leaves until the spring. Like Oak, beech leaves change colors–usually to a rich brown–with the oaks at the end of the fall season. Like oak, the beech holds onto her leaves throughout the winter (all beaches do this, while only some, usually young, oaks hold their leaves). The beech leaves grow very papery thin and crinkly as the winter progresses, but do not drop till after the tree is ready to bud for the spring. I think that the paper-like quality of the beech is important to note here–as I wrote about earlier on this blog, beech is a tree of knowledge and is synonymous with learning. It is, perhaps, fitting that most of the “book learning” which which beech is associated so strongly takes place in the winter months, when the crops have all been brought in and the snows fall. Most conifers (pines, spruces, hemlocks, cedars, etc) and other evergreens (like wintergreen or partridge berry) have a very different pattern. They certainly do “slow down” for the winter months, but spiritually speaking, I have found that the are still quite accessible during the year. For example, I take multiple trips a year to see the Old Growth Hemlock Grove at Laurel Hill State Park (near Somerset, PA in South Western PA) and regardless of the time of the year, the hemlocks there are happy to greet me and work with me all through the winter months. I have now made it a point to visit that grove at least twice a year: during the warm winter months near the summer solstice and during the cold winter months at the winter solstice. While winter and summer certainly offer different energy, the activity in that grove remains much the same. In other places along the landscape, much younger conifers, too, seem active and engaged in the winter months. I don’t necessarily think the kinds of spiritual work you can do with conifer trees in the winter is the same as the summer, however. I find a lot of this work as healing and inner work, like the trees working with me on myself and cultivating relationships with me, rather than “outer” work like a lot of the land healing I described in earlier posts last year. And different trees–by species and individually–offer different gifts, which is something else to keep in mind. I say “most” conifers in my opening paragraph to this section because the Tamarack or Larch tree (larix laricina) does not pattern on that of other conifers, but rather, patterns after deciduous trees. In the fall, it loses all of its needles and buds and regrows them in the spring, just like maple or apple. The Seneca legend I listed above offers a good explanation for this, that Tamarack grew weak and wasn’t able to hold his needles to the spring and succumbed to winter’s fury (but Oak, who he taunts, can in fact hold them). Whatever the reason, Tamarack is not a very accessible tree in the winter months. I know this post is about trees, but I want to speak for a minute about the mosses and mushrooms in terms of winter energy. Moss grows surprisingly well at the tail end of the fall and beginning of the spring season, and throughout most warm winter days. A trip to any winter wonderland is sure to have you in awe of the electric green moss, who is finally getting a lot of light for growth! The mushrooms, too, can grow during the winter days. 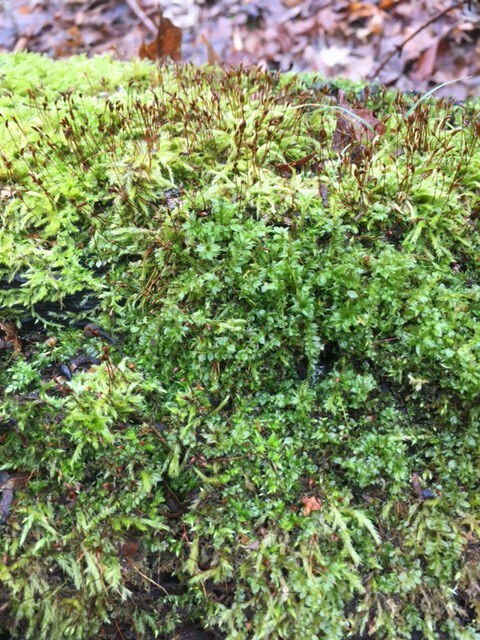 There is a layer of air not nearly as cold closest to the ground–and these small ones thrive in that environment–and the moss and mushrooms take every opportunity to thrive with the large ones dormant. Moss at the winter solstice! The winter is a good time to study up on your trees, to learn about them intellectually (drawing upon that energy of the beech tree! ), and offer blessings of abundance. Just last night, I was reading one of my favorite books that teaches me much about trees in my biogreion, Book of Forest and Thicket by John Eastman (he has three books in this series, all worth reading). Reading about trees from an ecological perspective, understanding what their seasonal patterns are and the species that are connected with them can help you have a deeper spiritual relationship with the trees. It is in the synthesis of knowledge and experience that we can grow our relationship with the land in deep and powerful ways. I want to close by saying that what I’ve written above about sacred work with trees through the seasons are simply my own observations and experiences. With the exception of the Seneca legend, which helped me put a few pieces together I had already sensed, I haven’t read this in a book anywhere or had someone tell me: these are just my observations, over a period of years, working closely in this ecosystem. I think that anyone who has an interest, given time and keen observation skills through the seasons, as well as developing inner senses, may gain a similar understanding of the seasonal changes and energetic changes in trees and plants in their own bioregion. I hope that others in the comments will share their own observations and help grow this general knowledge. 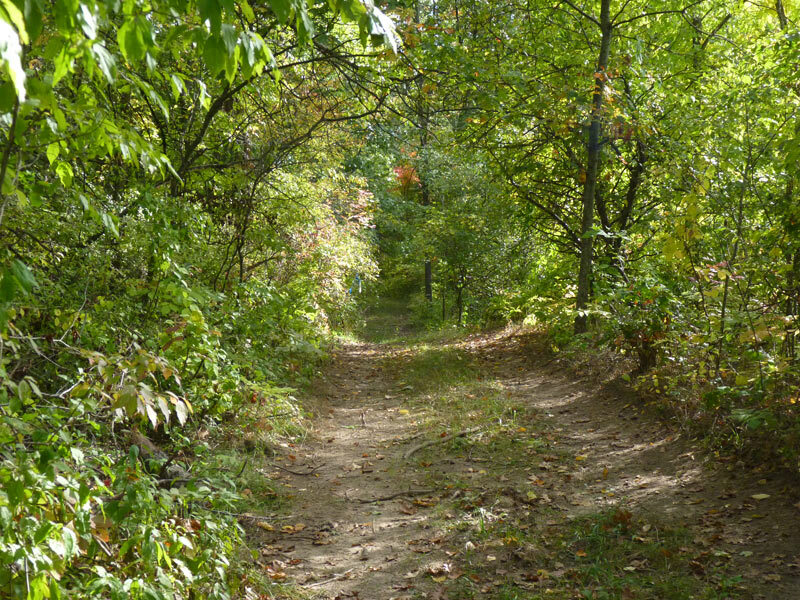 Path through the woods: how many ancestors walked here? As you might have noticed, my posts on this blog slow down considerably in the months of August – October. This is because as a single homesteader, I’m quite busy bringing in the harvest canning, drying, and freezing; preparing my garden for next year’s season; planting garlic and other fall crops; jumping in leaves; drying herbs; and generally enjoying fall, my very favorite of the seasons. My posts will become more frequent as winter approaches! I’ve been taking a lot of time to reflect this year, because this is the end of my 5th year as a homesteader and I’m coming up on 9 years as a druid–through these experiences, I’m really starting to feel that I am living the wheel of the year much more intimately and that I’m regaining something that my generation (and several generations before me) lost. Today I’d like to posit that many of the activities that I discuss on this blog, from finding wild foods to medicine making and growing and preserving the harvest is as much about reclaiming our human heritage and reconnecting to the land as it is about foraging a sustainable path in an increasingly unsustainable world. In other words, these activities give us a window both into the work of our ancestors and also to the future. To do this, I’m going to talk a bit about heritage, and the process of feeling like I am regaining some of mine with these practices. 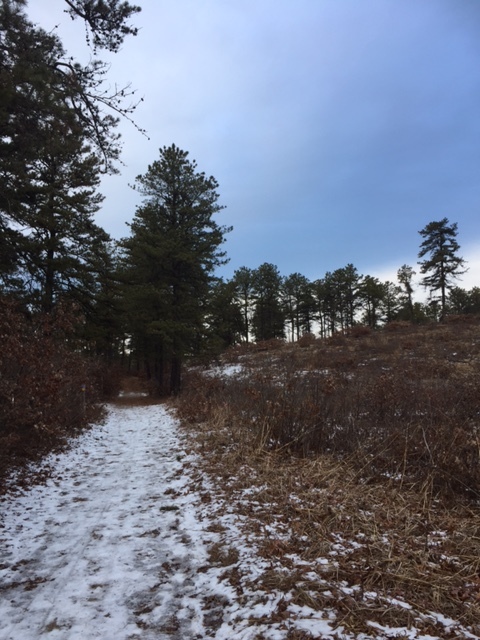 When I think about the kinds of things that were passed down to me as a child, I think about the time I spent with my grandfather Custer in the forest; where he showed me several edible and medicinal plants, where he taught me to see the tracks in the snow; where we would laugh and play in the forest. I only remember fragments, but I hold onto those dearly. I think about the lessons of my grandmother Driscoll, who would find a shiny penny face up on the road and bring it home and bury it beneath the front paving stones. Grandmother Driscoll, who made dandelion wine she never drank, who trash picked and made many things from nothing at all–these lessons are all part of my heritage. But there wasn’t a lot that they passed down; they were all too busy working multiple jobs, raising families, making steel in the mills. My grandmother Custer taught me many songs, songs that her grandmother had taught her. One song she taught me was called “a froggy would a wooin go”; I didn’t know it when I was a child, but I recently discovered that this song has roots as back as 1558….all those grandmothers passing down the song to their grandchildren. I think about that kind of history–500+ years of grandmothers passing on the song so that I was able to learn it as a child. And I’m glad for that tiny bit of heritage. But I also wonder what my great-great-great-great-great grandmothers knew and how they lived, I wonder what they knew about the kinds of things I’m trying to relearn–knowledge of root and stem and seed. We have almost no family records, I have no idea of knowing what they knew, how they lived, who they were. Most of all, since I lost all of my grandparents before the age of 15, I wonder what I would have learned if they were still alive, or if I had had a chance to know my great grandparents, or their great grandparents. I wonder what they knew but did not think it relevant to teach in a quickly changing world. I wish, knowing where I am heading now, that I could have conversations with them, learn from them these skills, these ways of living. I will also say, however, that my parents lived quite simply and, while I wouldn’t say they actively passed it down by teaching me the principles, we lived those principles growing up. Canning and gardening were regular activities in our house. My uncle hunted and brought us venison and turkey. We ate lots of zucchini from the garden. I kinda just saw them as hobbies, not realizing their significance till later in my own path. But I was grateful to have grown up with this framework as I began my own druidic and sustainable practice. I remember one day, sometime in the late 1980’s, my Grandmother Driscoll sat with tears in her eyes on the stoop where she buried so many shiny new pennies and she said to me, “Things were different when I was a child, Dana. Even during the depression, things were different. People needed each other then. We got on with very little. We were a lot happier. There is so much I know that we don’t need anymore.” Then we went inside and ate her homemade mushroom soup and made tiny doll clothes from repurposed fabric. I remember looking back on this memory long after Grandmother had died, after they had all died (many due to the illnesses associated with steel mills and coal mines), thinking that I had literally no heritage. That the traditions and knowledge of my ancestors (primarily Irish, Native American, and German) were completely lost to me. And truthfully, they pretty much were. Much of my family had come to America at least four or five generations prior to my birth; those who were Native had long since been forced to lose much of their own history or died trying to retain it. Those that were Irish changed their names and eradicated their cultural practices due to discrimination. The Germans had fared the best, and in my home region, we still had remnants of “Pennsylvania Dutch” folklore, cooking, and even, as I discovered only recently, a magical tradition called “Braucherei.” For all of my 20’s, however, I felt that I had literally no traditions to keep, no heritage to pass on. This was, of course, compounded by the fact that I had rejected the religion of my parents (Christianity) and most of their holidays, and while I had tidbits of knowledge and songs from my grandparents, I felt like I was a person living with nothing. 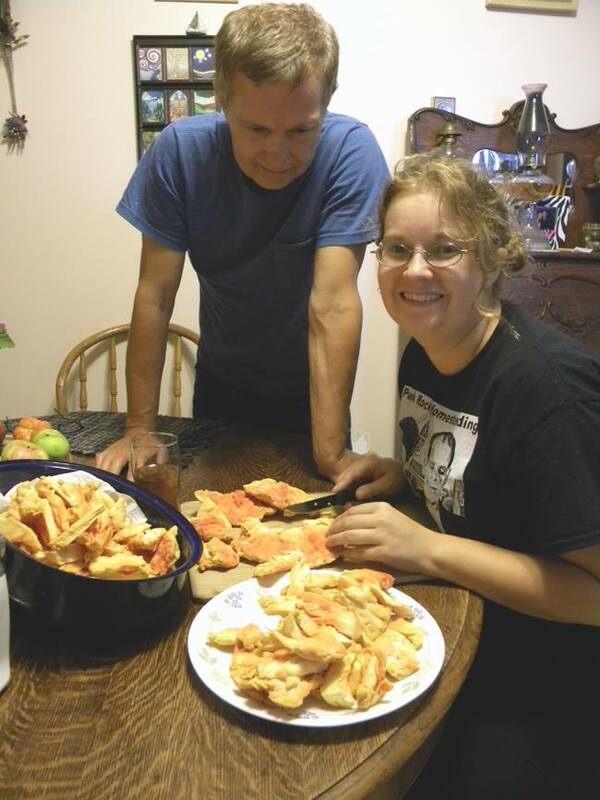 Dana and Dad cutting up Chicken of the Woods Mushrooms! In the Tarot, the “tower” card represents a crashing down, a clearing of the way, with the opportunity to build anew once the dust settles. In some ways, I kinda see this whole situation in a generational way: me as the 21st century product of the crumbling dust of the tower. I live in the remnants and shadows of the lost ancestral knowledge about how to live from the land, about how to build communities, about how to interact with each other; I live with the fragments of traditions that hadn’t been passed on because of a rapidly changing world. Through the work of the last five years, I realized rather recently that I was building something anew where I had perceived this empty wasteland of family heritage and tradition. I became, thanks to two of my close friends and mentors, obsessed with reading old books full of old knowledge (the 1970’s has much to offer, but previous decades and centuries even more so). I attended workshops, classes, learned by doing, talked to old wisened elders, learned everything I could (a process that shows no sign of ending anytime soon). I also looked to my parents and their practices and saw their lifestyle with new appreciation. I realized that I was building a new heritage that I could pass on by rediscovering the past, how others had lived, by studying the plants, by learning to grow and forage for my own food, but also melding those practices with druidry. Druidry gave me the spiritual framework to understand the work I was doing and to understand and refect upon my practice it in useful and productive ways. Druidry, with its own spiritual heritage paralleling the rise of the industrial revolution (and in many ways, responding to it) provided me with grounding and daily practices that helped me further understand myself and gave me tools to walk the tightrope between the worlds. The other thing druidry and my sustainable practice was doing for me was helping me pull away from the heavy consumerist haze which had dominated the lives of so many of us growing up in the 80’s, falling into video game addictions in the 90’s and 2000’s (and yes…I was deep in fantasy land for way too long). It helped me regain my footing, my connection to the land, my sense of self. And now, I am starting to understand the power in returning to the land in whatever way one can–by enjoying the fruits of one’s labor and cultivating close relationships with plants. By making one’s own medicine to heal oneself. By being happy that one has built up the calluses needed to do a few hours’ work in the garden. By not only celebrating the wheel of the year, but understanding from a growth standpoint what happens to the plants after the Fall Equinox comes and joyously waiting the return of the Spring Equinox. By learning the secrets of the soil. By just practicing being happy and quiet and not running around like crazy all the time. There is something so powerful about being even a little independent and self-sufficient. Its a ton of hard work, yes, but it gives you something meaningful. Perhaps the most magical of all is that its not just me that has found this path–my immediate family, too, is transforming and regaining the oak knowledge of our ancestors. 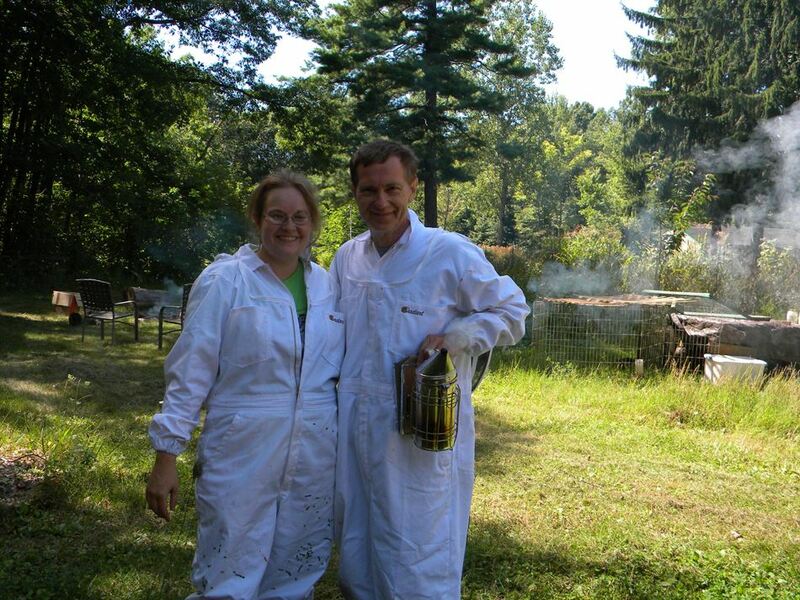 Some of the photos I’ve shared in this post are of us doing various activities that we are discovering together–beekeeping, mushroom hunting, and so on. My mom was the photographer in all of these images. We have, collectively, worked to rediscover and build a new heritage and tradition for ourselves that allows us to once again live close to the land and all of her inhabitants. 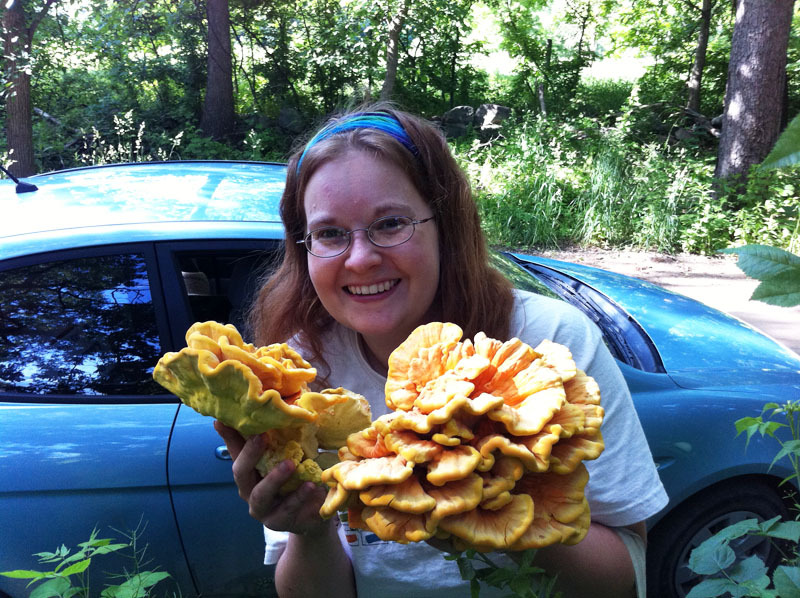 Last year, for example, I taught my parents about mushroom hunting–and they have become serious hunters, and now are teaching me new things. This year, my sister and I are on parallel paths learning the ancient ways of herbalism and medicine making. I have seen this same thing occurring in the lives of many other friends’ families–its if we are all waking up to rediscover our relationship to the land and working, as families, to build that knowledge once again. I am so grateful to have found this path–not only does it give me ways of living that help me personally address the larger predicament that we face, but it also reconnects my entire family with the knowledge of our ancestors. It enriches our lives. Even though the chain of knowledge was broken and many traditions were lost–druidic, sustainable practice can help us build new traditions and “oak knowledge” that we will be able to pass on. I was excited to attend another workshop at Strawbale Studio, this one on Mushroom Cultivation lead by my good friend Paul. 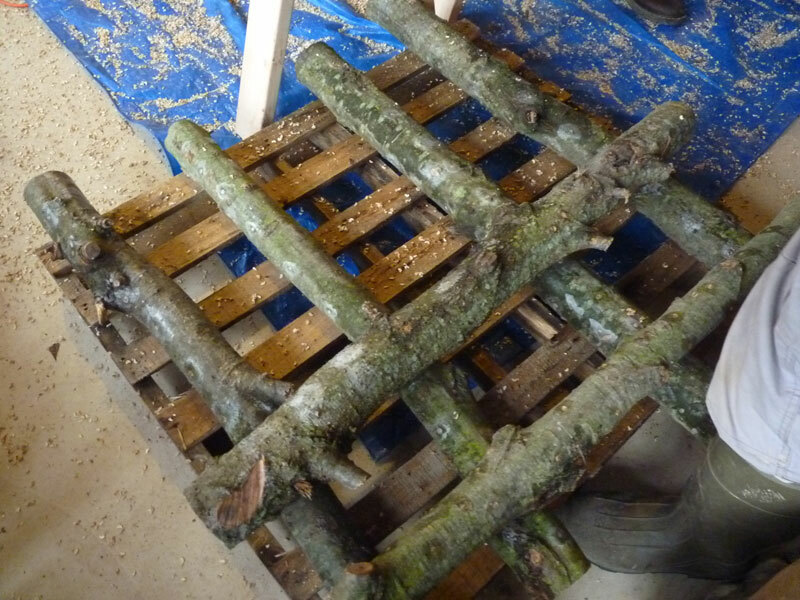 I’ve blogged about starting mushroom beds before–this post will cover mushroom log inoculation, which is one of the things we covered in the workshop. 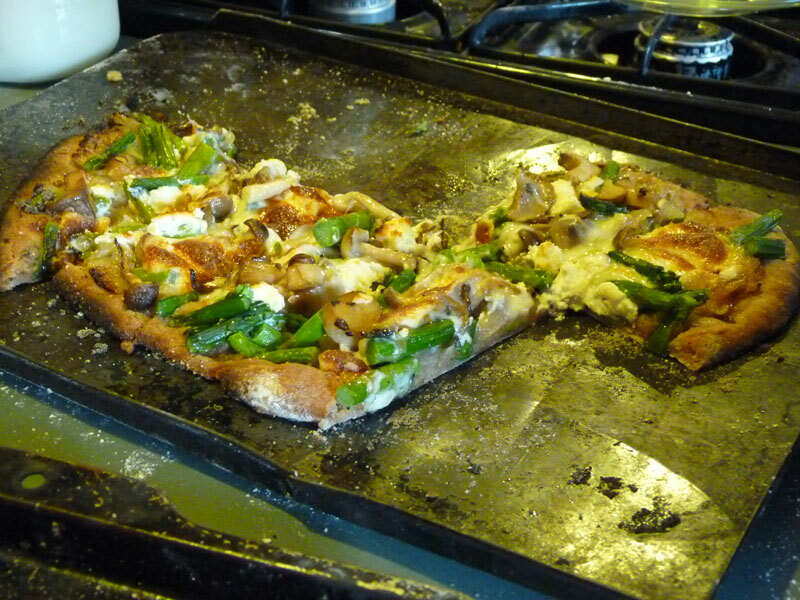 One of the reasons to grow mushrooms is so that you can make mushroom pizza, obviously. 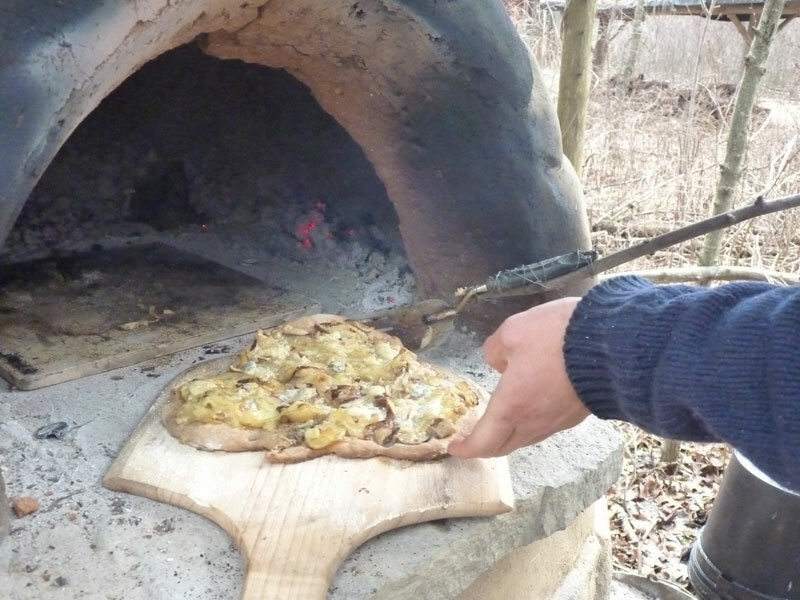 This is being cooked in Strawbale Studio’s outdoor oven–no electricity or fancy equipment required! Fresh medicinal and gourmet mushrooms grow in a variety of circumstances–including in the wild on old, rotting logs. 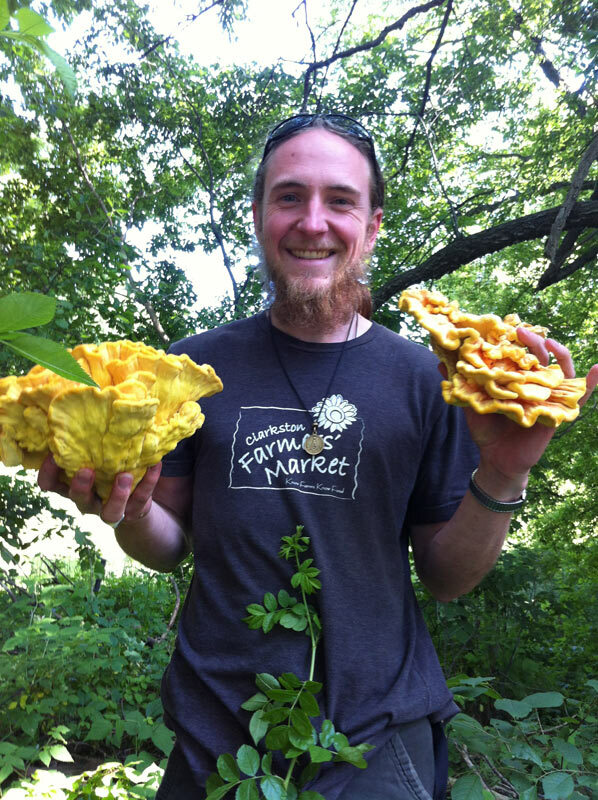 We can inoculate logs directly to encourage mushroom growth and get a wonderful harvest of mushrooms (and I should add that gourmet and medicinal mushrooms are hard to find at farmer’s markets, at least in this area). 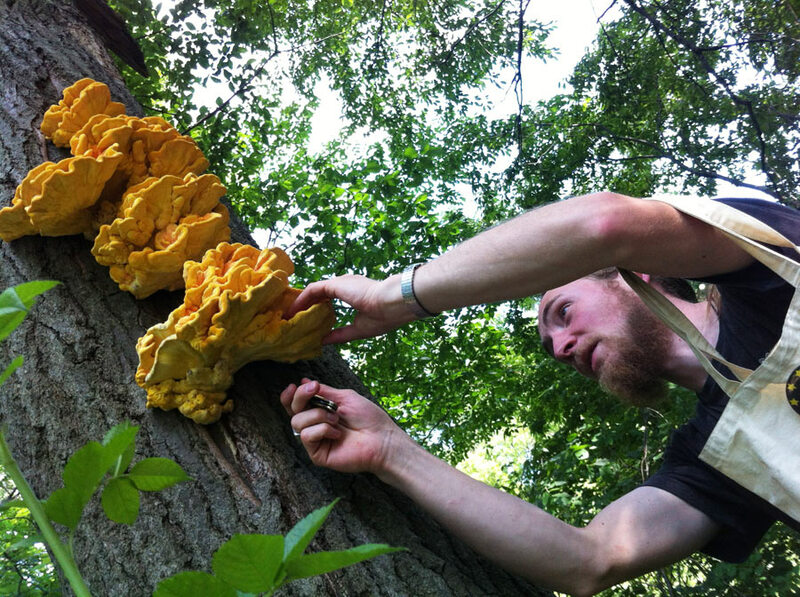 Gourmet and medicinal mushrooms, such as Shiitake, Oyster, Chicken of the Woods, Reishi, and Turkey Tail, are a wonderful addition to a localvore diet, and growing them on your own property means less in terms of fossil fuel consumption. Mushroom log inoculation has a long history (most early experiments with Shitake, for example, took place in Japan and later China), and its actually pretty simple for the average person to do. To inoculate logs, you will need either plug spawn or sawdust spawn. We used Shiitake plug spawn from Easygrow Mushrooms, which is a fantastic local South-East Michigan Company. 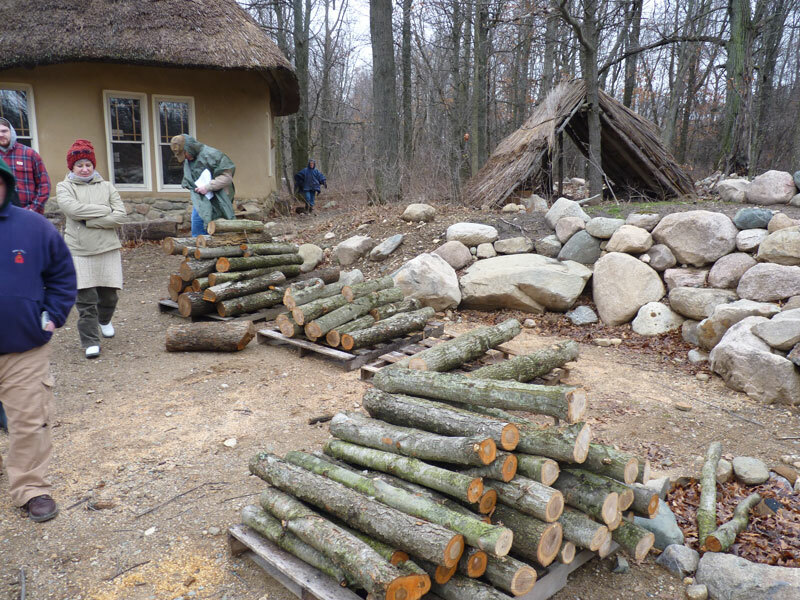 Mushroom logs as part of permaculture design. With the exception of plug spawn, which you do need to order (and we are lucky enough here to obtain it locally from two farmer’s markets), the rest of your materials should be tools that you likely already have and local wood. 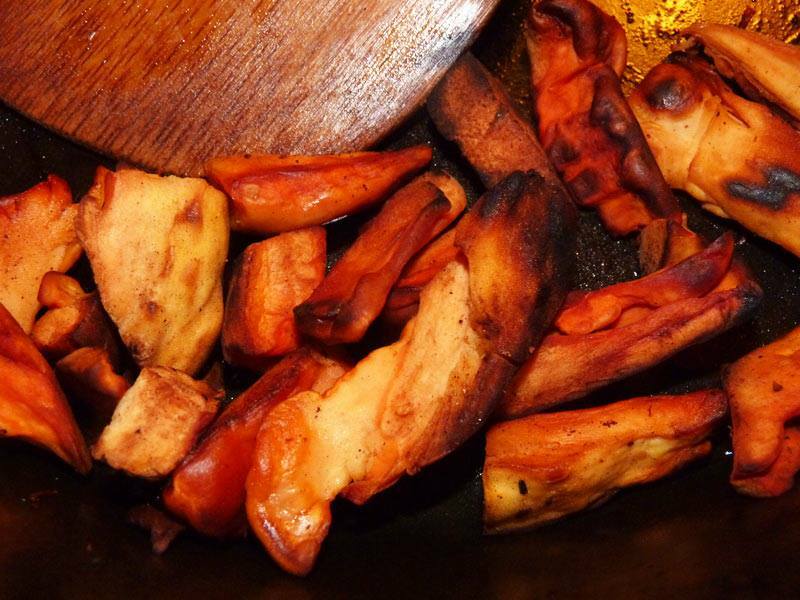 This makes mushroom growing a rather sustainable activity, and one that reduces your impact. This is especially true because many mushrooms, such as Shiitake, are shipped the whole way from China. 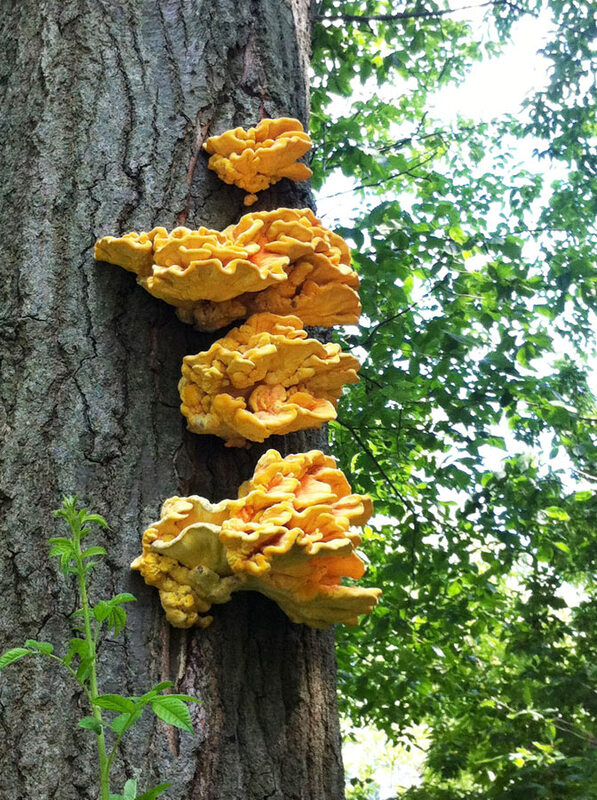 Other mushrooms, like the most amazing Chicken of the Woods, which really does taste like chicken, are rarely if ever available commercially. So growing your own mushrooms increases your own resiliency, allows you to use wood that is already available, and reduces your own demands on the system. 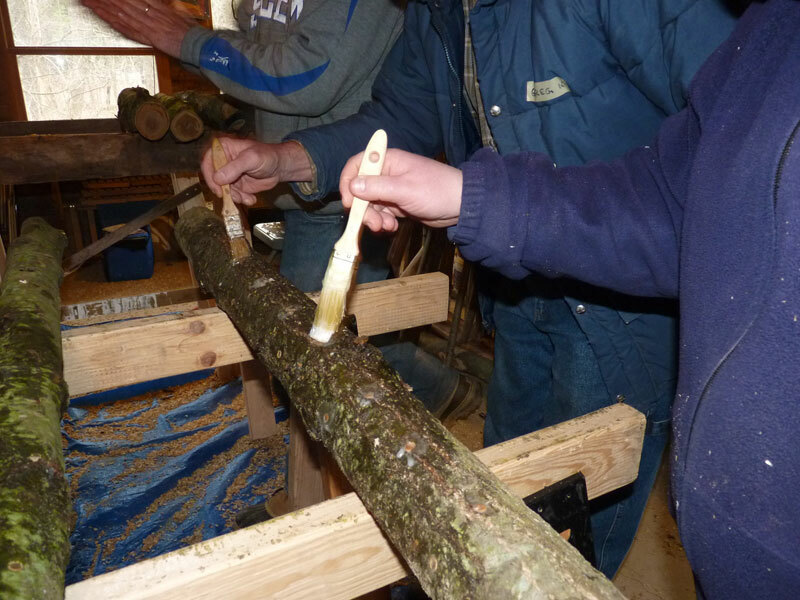 The process of innoculating logs. I’m going to use Shiitake mushrooms as my example because that’s what we did in our workshop. 1) Obtain very fresh, hardwood logs with thick bark. You can use fresh fallen hardwood (such as if a tree comes down after a storm). 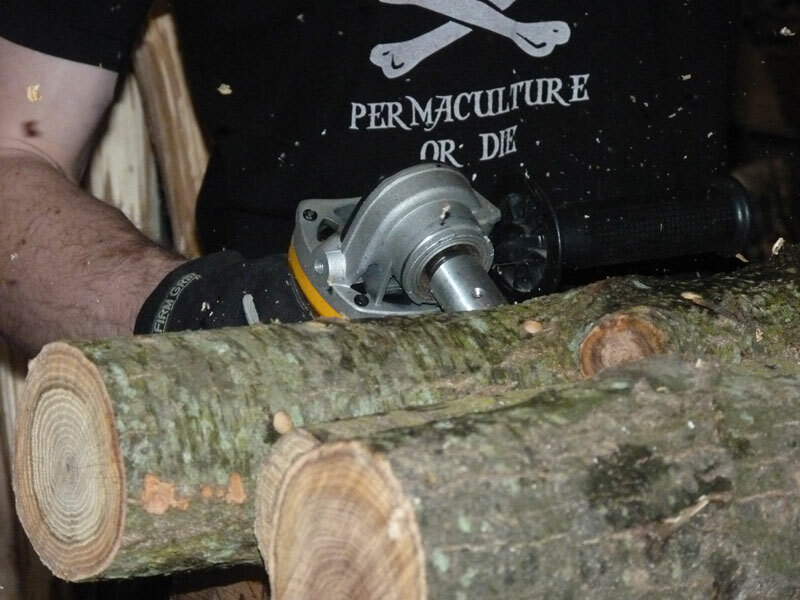 You can also cut trees yourself (of a manageable size), for shitake, a non-aromatic hardwood such as oak, cottonwood, elm or maple works well (we used oak for our logs–how druidic!). 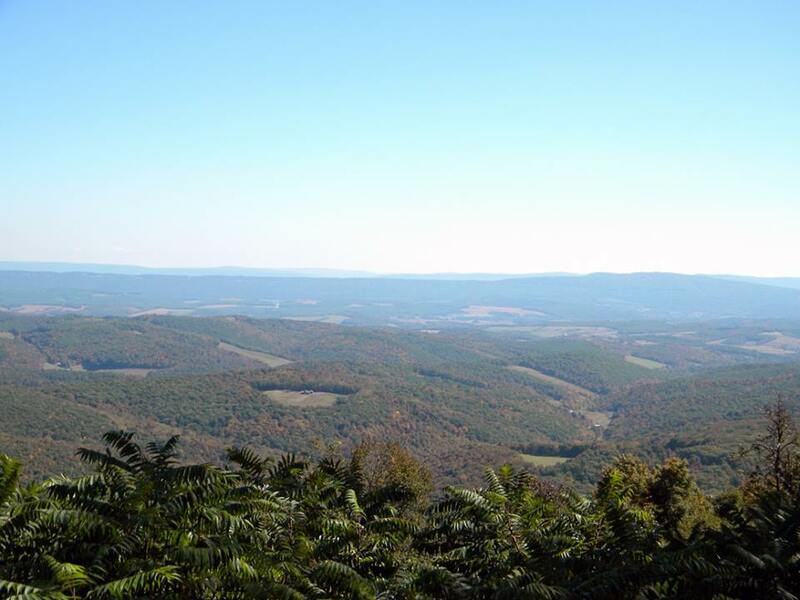 Cutting is suggested for the fall, winter or spring. Obviously, we did ours in the spring! 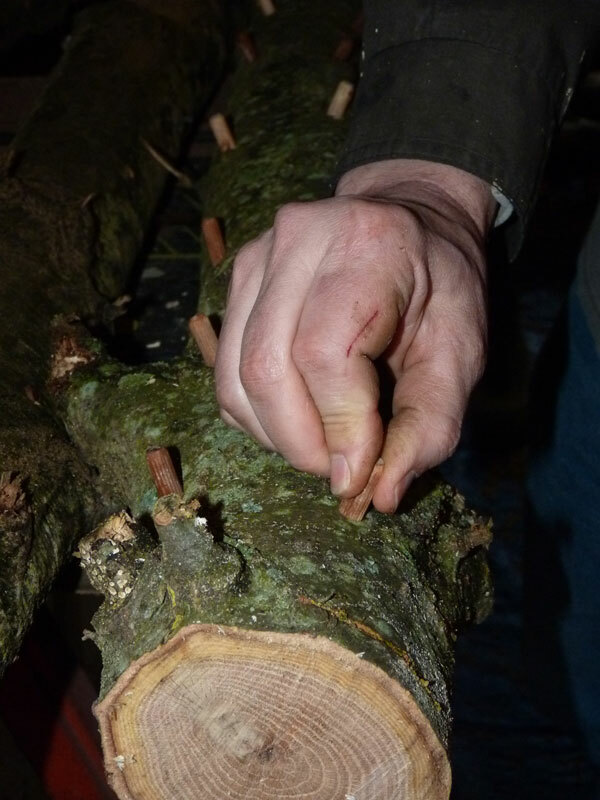 Try not to damage your logs as you cut them much–non-wanted fungus can invade logs with lots of damage easier than those with good, thick bark. 2) Stack your logs off the ground. The key here is making sure no dirt comes in contact with the log. This is critically important, as every gram of dirt contains over 12,000 types of fungus and spawn–and you want a pure log to inoculate. We stacked ours on pallets. If your logs do get dirty, you can slice the ends off of them. 3) Wait 1-2 weeks. There is some debate about the next part–some mushroom experts say you need to wait 1-2 weeks at this point, while others say you can inoculate almost immediately. We waited 2 weeks on our logs. The thinking behind the wait period is that trees typically have an anti-fungal properties, and if you innoculate sooner than two weeks, those properties may interfere with your mushroom logs. 4) Drill your logs. Holes for plug spawn (which is what we were using) can be drilled with a 5/16″ bit or a special bit (which our workshop leader, Paul, had that he purchased from Easy Grow Mushrooms). Drill holes about 1″ deep and then immediately innoculate. The holes should be drilled in a grid pattern, starting about 2″ from the edge of the log, and then going every 6″ or so with about 3″ between rows. 5) Inoculate your logs. 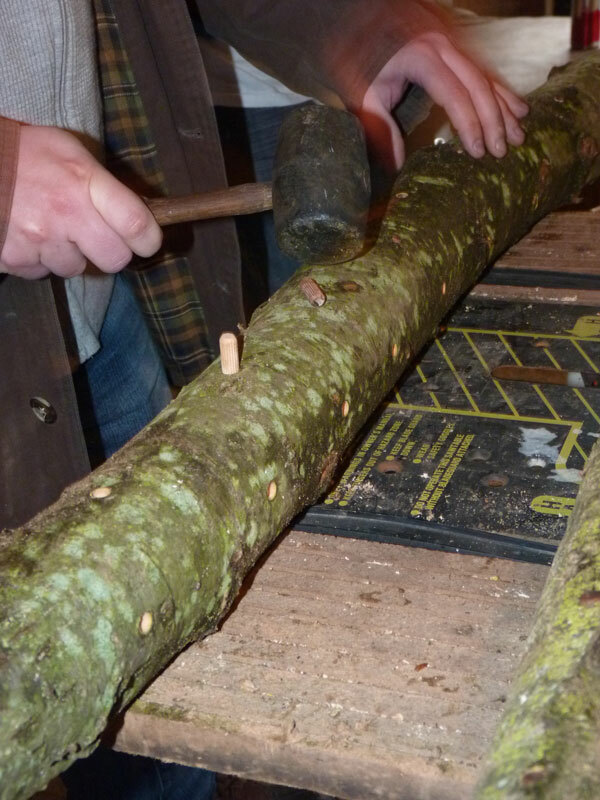 Place the plug spawn in your log, and then use a rubber mallet to pound the plug into the log. 6) Wax your plugs and any other “injuries” on the log. 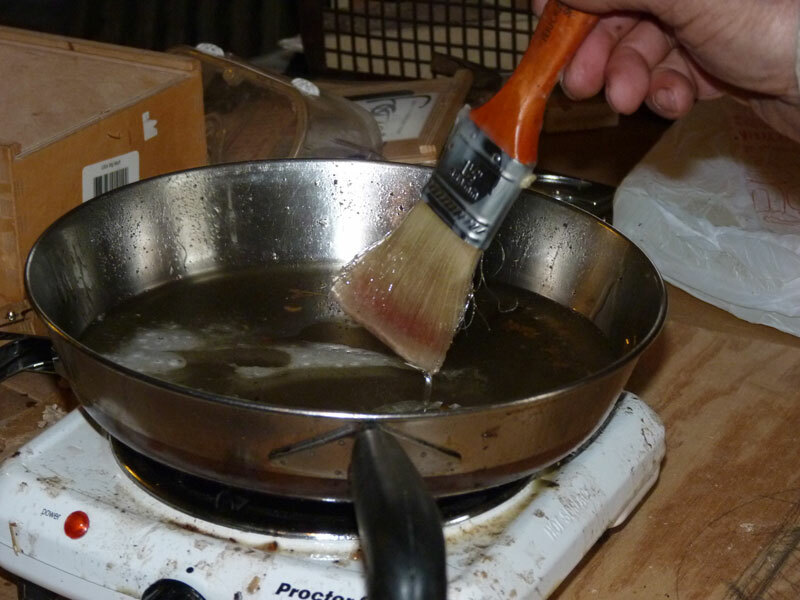 Melt wax (a little crock pot is good for this) and then wax over each of the areas you plugged, making sure a good seal is obtained. This is to prevent any other fungus from getting into the plug areas. You can also wax areas you damaged (like a place where you trimmed off a smaller branch or where you damaged the bark). DO NOT wax the ends of the log. 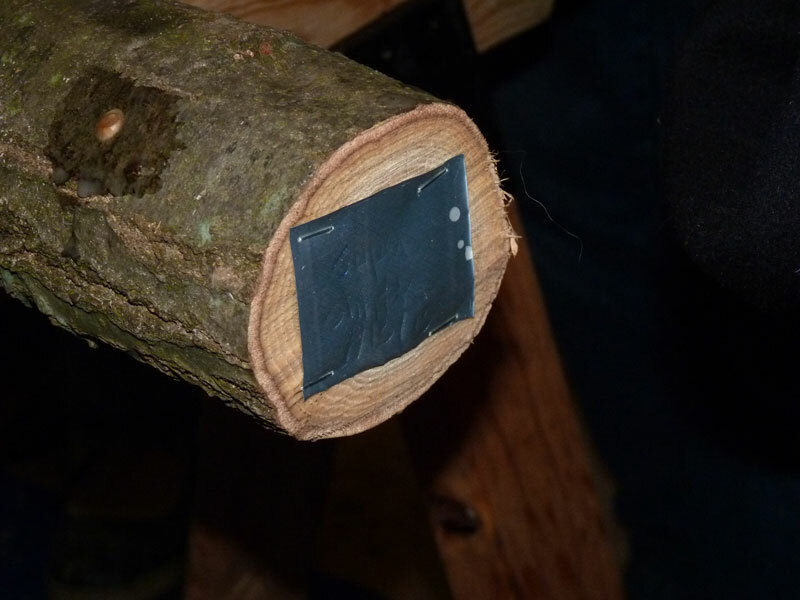 7) Label your logs. You should get in the habit of labeling your logs with the kind and date. We labeled ours by cutting up old soda and beer cans, using the inside of the can, we used a nail to write into the can, and then stapled the metal tag to the end of the log. 8) Stack your mushroom logs off the ground in a shaded area. If you stack your logs on the ground, again, the dirt can contaminate them. If you are doing a lot of logs, you can stack them in a grid pattern. If you are doing only a few, you can just stack them on bricks. Do stack it somewhere you can remember to check on it every once in a while! You can “crib stack” logs if you have a lot of them. These will be moved outside later. 9) Every 6 weeks or so, soak your log (s). You don’t want your log to dry out, so while the spores are spreading, you can make sure they have enough moisture. 10) In 9-12 months, enjoy mushrooms! Obviously, harvest is the best part. Our logs haven’t gotten this far, but what we learned was that we should cut, rather than pull, mushrooms. Cutting mushrooms ensures that you aren’t disrupting the mycelium (which is the body of the fungus, the mushroom itself is just the reproductive organ). When your logs really get going, you can harvest quite a bit!